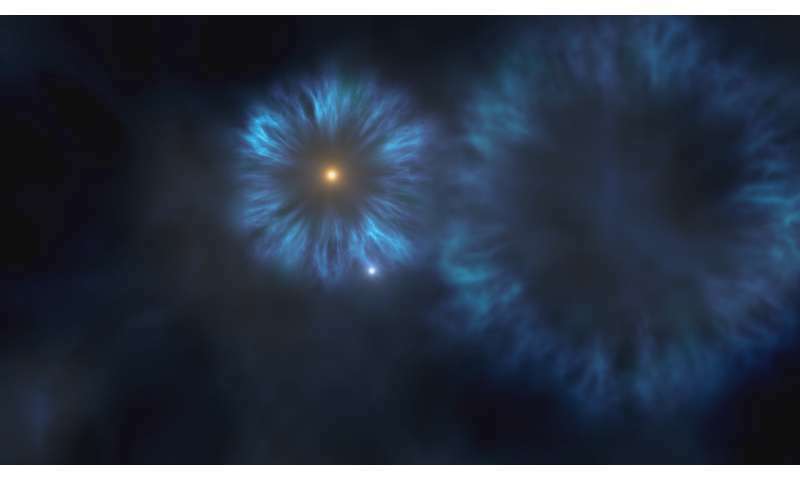 Researchers at the Instituto de Astrofísica de Canarias (IAC) have identified a star that is a key to the formation of the first chemical elements in the galaxy. The results of this research are published today in The Astrophysical Journal. The study presents the discovery of one of the stars with the lowest observed metal content. The star is 7,500 light years from the sun, in the halo of the Milky Way, and is along the line of sight to the Lynx constellation. The star is still on the main sequence. Its low mass, around 0.7 times the mass of the sun, although it has a surface temperature 400 degrees hotter. This discovery was made using spectra obtained with OSIRIS (Optical System for Imaging and low-intermediate-Resolution Integrated Spectoscopy) on the Gran Telescopio Canarias (GTC), at the Roque de los Muchachos Observatory (Garafía, La Palma). Spectroscopy allows astronomers to decompose the light of celestial objects to study their physical and chemical properties. This reveals that J0815+4729 has only one-millionth of the calcium and iron that the sun contains, but it has a comparatively high content of carbon, almost 15 percent of the solar abundance. "We know of only a few stars of this type in the halo, where the oldest and most metal-poor stars in our galaxy are found," explains David Aguado, an FPI-SO (Severo Ochoa-Training of Research Personnel) research student at the IAC and the University of La Laguna (ULL) who is the first author of the article. "Theory predicts that these stars could use material from the first supernovae, whose progenitors were the first massive stars in the galaxy, around 300 million years after the Big Bang" says Jonay González Hernández. "In spite of its age, and its distance away from us, we can still observe it," he adds. In fact, this star was first identified from the SDASS (Sloan Digital Sky Survey) database, and it was later observed with the ISIS intermediate dispersion spectrograph on the William Herschel Telescope (WHT) of the Isaac Newton Group of Telescopes, which is also at the Roque de los Muchachos Observatory. "This star was tucked away in the database of the BOSS project, among a million stellar spectra which we have analysed, requiring a considerable observational and computational effort," said Carlos Allende Prieto, another IAC researcher. "It requires high-resolution spectroscopy on large telescopes to detect the chemical elements in the star, which can help us to understand the first supernovae and their progenitors," he emphasized. In the near future, the HORS high-resolution spectrograph, presently in a trial phase on the GTC, will be a key instrument for the chemical analysis of weak stars such as J0815+4729. Rafael Rebolo, the director of the IAC and a coauthor of the paper, says, "Detecting lithium gives us crucial information related to Big Bang nucleosynthesis. We are working on a spectrograph of high-resolution and wide spectral range in order to measure the detailed chemical composition of stars with unique properties such as J0815+4719."